Part 1: Introducing Andrew – and Toby! Inside his garden studio, Milne Graden brand artist, Andrew Davidson works his own magic crafting beautiful woodcut illustrations. His lively and whimsical depictions bring life to this place on The Tweed and captures its magical spirit. 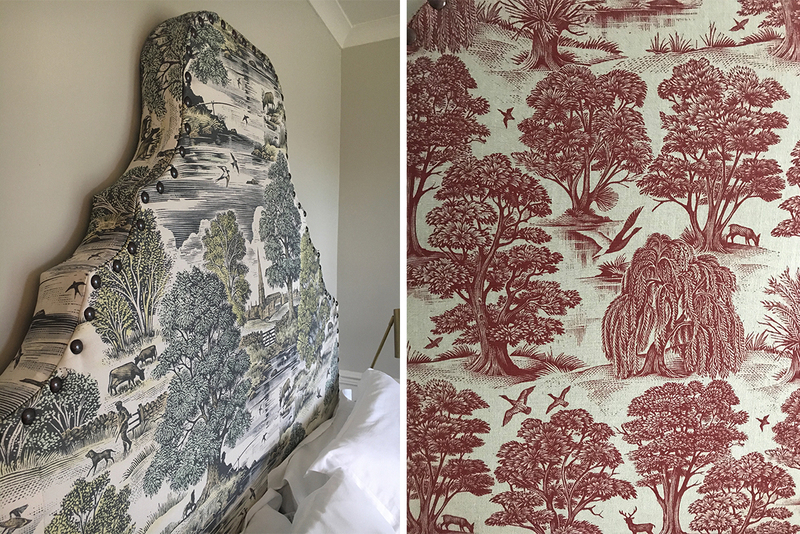 Andrew’s creations can be found throughout our holiday cottages, from guest literature to bespoke fabrics. Our relationship began in 2014 and after experiencing life on the Tweed at Milne Graden with a visit to Hamilton House – he understood what we were talking about.  This year he has designed the special anniversary blog header for our blog site – an ongoing part of our Milne Graden Magic 10 Year Celebrations. 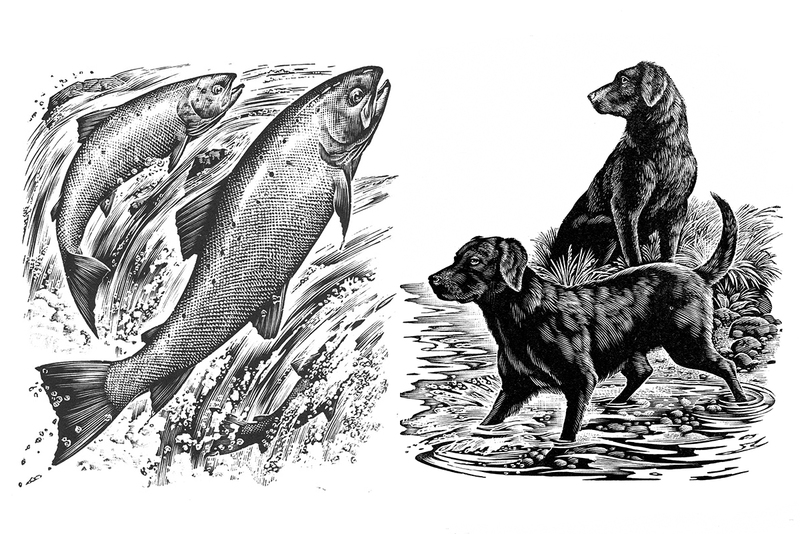 Over the years, Andrew’s work has included our faithful Labrador companions, Ruby and Molly, as well as some of our seasonal wildlife regulars. Not to mention our plucky resident cockerel and his ladies! We have just discussed with Andrew an idea for the next piece of work to be added to the Milne Graden collection. It was at this point we decided we wanted to learn more about the artist himself. 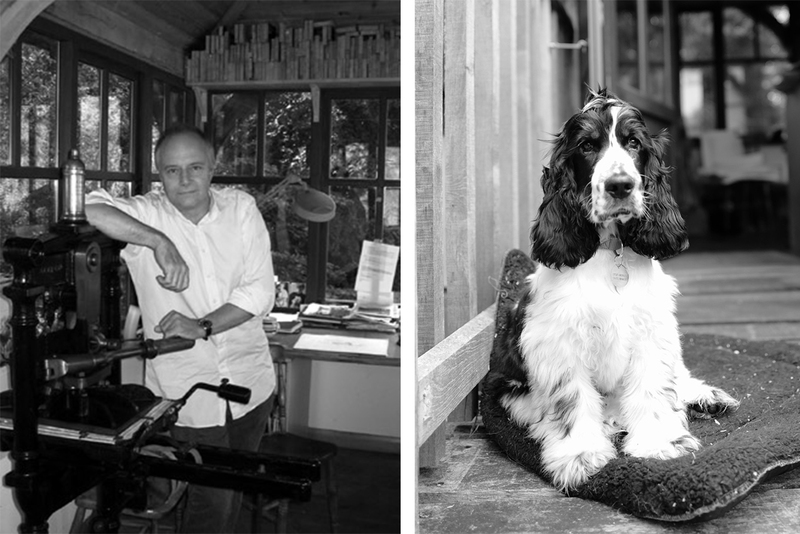 “Having a dog is the most wonderful thing, it gets you out of the studio in the morning”. Andrew loves dogs as much as we do. Our faithful four-legged companions have proved their worth yet again – not that we needed any convincing. The dog in question is Toby, Andrew’s cocker spaniel. A lovely tri-colour bundle of energy – and just look at those dreamy eyes! He sometimes uses a sketch book to record his observations and on occasion, might do some “dreadful oil paintings” – impossible to imagine such a thing! Mainly though, what he sees gets filed away in the “internal image bank”, providing scenes to draw upon when back at the studio. When beginning a new piece of work, Andrew initially takes time to quietly contemplate the composition. “I sit down and think, what am I trying to say? Each illustration is different, there’s no formula, its just experience”. This dedicated approach along with depth of thought when approaching each individual piece of work is what each client experiences when working with artists like Andrew, and we try to have the same approach here at Milne Graden. In an age of fast fashion and throwaway culture, Andrew is refreshing, something which echoes our own values. Throughout the holiday cottages, carefully considered art and design underpins all of our interior spaces. We invest in quality for the long term enjoyment of all our visitors. A wit and wry sense of humour is apparent from the off-set and indicates that, despite this man’s obvious talent and high profile client-base, he doesn’t take himself – or life – too seriously. So how will Andrew interpret our latest challenge: a harvest mouse illustration to celebrate Mouse Cottage, the up-and-coming addition to the Milne Graden holiday cottage collection – keep an eye out here for more on our 9th cottage later in the year! Immediately he is thinking of the festival of harvest, and relishing in the details. Inspired by the “reflective qualities of the berries, the textures of the end of summer – the sharp outside edges…” All the things we look forward to across the estate at this time of the year. But he laughs and says “of course this doesn’t exist yet, it only exists once you put it onto paper” So until then, we’ll have to watch this space. Next month, in Part 2 we re-join Andrew in the studio, to gain a behind-the scenes-insight into the process of creating the Milne Graden Harvest Mouse.